Internet browsing is actually one form of distraction that is chock full of info and today I share how to make it work for you and a strategy for managing all the info you’re consuming. You can turn your social media time – or that previously mindless, wasted distracted time – into a productive mission and become an active creator in your own life. How to organize what you’re consuming into useful info. You’ll learn how your whispers are sending clues to you —so stop and notice! You’ll learn how to build up the muscle of tuning in and teasing out the “whispers” in your own daily life. You’ll discover how to dig a little deeper into the things that catch your attention and mine them for info about what is missing in your life. Today, we’re talking about a skill that’ can help you turn the time you are spending (and possibly wasting!) browsing social media into an activity that is fun and productive! I’ve developed a method for organizing the things that catch my attention that I am sharing today. When you stand back and look at the images that you’ve saved, you’ll be able to see patterns that will give you really valuable info. Today’s episode is a combination of practical strategy and a new way to think about something you do everyday without thinking about it. I hope you enjoy! You have a whole deep well of info available to you…if you just listen. This week’s free bonus content, “3 Simple Steps To Start Listening To Your Whispers,” will help you get started. 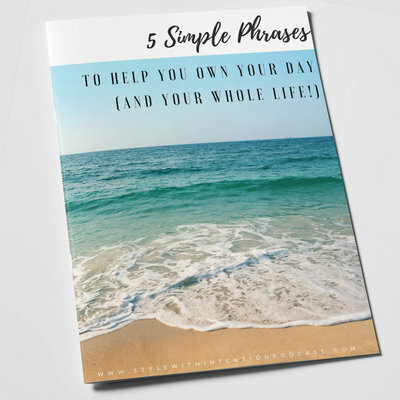 It will walk you through the simple steps to help you start listening in – so you can kick-start your journey to a life of more ease, joy, and direction. This guide is perfect for anyone who wants more clarity in their life by tuning in to their slippery, subtle thoughts. Download it now so you’ll have it anytime you’re looking for a little help accessing your own guidance. and we’ll send it out right away! 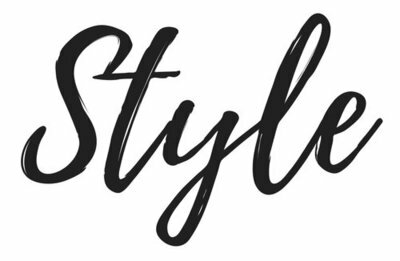 Welcome to the Style With Intention podcast where we talk about how to use your personal style choices as a tool to create a life you love. We believe choice is empowering, complacency is boring, and happy looks really, really good. I’m your host, Annie Kip, and today we’re talking about ways that you can use what you’re probably doing anyway, browsing the Internet and looking at Instagram and Pinterest and maybe even Houzz to get a clear idea about what you actually want. This is the beginning of the creative process and I use this with my clients when we’re trying to figure out how they want to feel in their space or with their wardrobe. We’re gathering information and sorting out what aligns with them and what doesn’t. Yes, I believe that you can find clues to the life you really want to live by looking at social media. Isn’t that great news? You can do what you’re already doing and get so much more out of it. Social media is maligned often and I curse it myself for being sort of the new opium of the masses. I know I am not the only one who can go down the rabbit hole of Instagram and Pinterest just flipping through photos mindlessly. Seriously. A half an hour can go by before I know it. It’s addictive because it is so easy. Just one more picture, just one more picture. I do it all the time and sometimes that’s fine. It’s okay to want a break from what we’re doing. I love seeing what my friends are up to. I get great ideas from seeing what other people are doing with their homes or what they’re wearing or what they’re reading. Sometimes it’s exactly what I need for a few minutes, but there comes a point when I have to admit that it becomes a way to avoid something else. It’s a distraction. I know this is true and I have to admit that social media isn’t the only way I distract myself. I’ve seen myself do it with cookies and getting up from my desk for another cup of tea, but I’ve discovered that Internet browsing is actually one form of distraction that is chock full of info and I’m going to share with you how to make it work for you. There are clues here and I’m going to share the strategy I use for managing all the info that I’m consuming. You can turn your social media time – or that previously mindless, wasted distracted time – into a productive mission and become an active creator in your own life. When you’re distracting yourself, the first thing to ask is: what from? what are you not wanting to do? Or what are you not wanting to look at? What’s making you feel powerless or stuck or frustrated? Where in your life are you bored or wanting something more or a kind of input? What prompted you to open up your social media in the first place? If you can get an idea of what that distraction is serving, you can use the simple strategy I’m about to share with you even more effectively. If you’re like me, that distraction usually turns bad at some point anyway, too much of this mindless consuming ends up making me feel tired and sort of overwhelmed with how much I could be doing. Instead, I lose the initial feeling that I had that was kind of inspiring when I first started looking and the ideas that I was getting start to kind of get jumbled and I lose track. It all becomes a mush of should’ve and could’ve, and before long I’m feeling sort of lousy about myself, that not only am I procrastinating and not getting my work done, but that I don’t have time to do all the things that I want to do and that I see people doing on the Internet, and then I think, I’ll never have all the things that I see and love to look at in the pretty pictures. Let’s kick those bad feelings to the curb. By getting into detective mode, you can make that distraction time count even by shifting how you think about it. You can use what you’re looking at online to build a better life for yourself. The trick is to capture your thoughts and feelings. Don’t let them just float by and just I want to caution you. Don’t make this into a big project with an end goal either. Let yourself play a little bit. This is sort of active play. This is a lot to do with those whispers that I’ve talked about so much on the podcast. You can go back to episode #2 “Listening To The Whispers” and listen if you want to know more, but basically it’s about noticing that little wisp of information or that quick hit you get. When you see something and it sparks you. A whisper is a clue that something aligns with your deepest wants and needs. You don’t have to totally understand it or make sense of it. You just have to notice it. Your intuition is always ready and waiting for you to pay attention. The more you give it space to live in your daily life, the sharper and stronger it will become. Once you get into the habit of doing this with your social media browsing, you may find that you are doing it in other ways and expanding your detective work into the other areas of your life as well. We’ll talk more about this at the end of the episode and I’ll give you some ideas, but first I want to get you started so that you have a place to store all this important info that you’ve just been brushing by until this point. So do these things in preparation. First, make sure you have the pinterest app downloaded to your phone and make sure that you have it set to access your photos. You can also use the info that you might’ve discovered when I asked you to think about what you’re distracting yourself from. What is the area of your life that you’re trying to escape from? What isn’t feeling delicious and easy in your life? Trying to put a name on it and you can always come back and change it later. These boards will become your personal, private, visual journal. I’ve always used journal writing to help me see patterns in my life and sort through my thoughts. These private Pinterest boards are a great way for you to create your own visual journal. I actually think that the visual pictures might even be more powerful because it gives your brain a way to really sort through what aligns and doesn’t align with who you are and where you’re headed and who you’re becoming in a really deep and visceral way. Whenever you notice that you are browsing mindlessly, make yourself take a second and capture the image. You can do this in several ways. You can screenshot the image on your phone by pressing the buttons on both sides of your phone, which you probably already know, or if you’re on a laptop or a desktop computer, you can take a screenshot using a clipping tool. On a PC, it’s called clipping tool, and on a Mac you just hit shift command four to bring up the clipping tool. This will save an image to your pictures. Many of the images on a line also have a little pinterest icon on them. You may have noticed which will let you pin the image straight to your boards, click on it, and you can pick which one it goes to. Now, once you have a selected, an image that sparks you, that grabs your attention, take a minute and indulge in the feeling that it gave you sort of settle into it, wring it out, milk it. Try to really get a grip on what it is it is making you feel. Think about what the image spoke to you. What did your imagination do with it? How did you embellish from the picture? Maybe it was a bright sunny studio space that caught your eye and you could sort of imagine how nice it would be to work in that space. If you can expand on the imagining and think about, would you be there alone or would you be there with other people? Would there be a nice coffee shop right down the street? Can you hear the patter of rain on the roof as you work? What kind of work are you doing in their writing or working with your hands or teaching? This information is key to helping bring into focus what you really want, so I want you to do this before you do anything else. After you’ve had a chance to think about this and what this image is sparking in, you, open up the image and your photos and click on the little icon for sending. It’s a square with a line through it will show you a picture of it in the show notes, but save it to your pinterest boards. Next, make whatever notes you can about your imaginings and the thoughts you had. When this picture struck you. Capture those whispers, those fleeting thoughts, those slippery ideas. This is where the magic happens. Bringing what you really wanted to focus starts with identifying the feelings that you really want. As I mentioned, you will develop this muscle and get better at noticing when the whispers or speaking to you. They come and they go so quickly, but throughout your day you can sometimes notice when something grabs your attention. Get into the habit of taking pictures. As you move through your world, maybe you’ll notice a shoe or a nail polish color or a shape of a wall or a texture in nature. Let yourself be drawn to what you’re drawn to. Don’t edit yourself. Act quickly before the negative self talk has a chance to creep in and tell you that taking a picture is silly or that you really don’t like what you think you like or that this is unrealistic. You can decide that later. Just capture the whispers for now by capturing these images that speak to you and putting thoughts in words with them. You are letting your deeper self guide you and you’re able to capture your slippery inner thoughts. These flashes of Info come and go so quickly, especially when we aren’t in the habit of having preferences or noticing what actually appeals to us for so much of our lives. We breezed by our own wants and needs. Taking care of other people and doing what needs to be done. My gosh, we don’t even go to the ladies’ room when we really need to for heaven sakes. We ignore our basic instincts because we don’t want to inconvenience people or put them out or seem selfish. This, this practice of using your social media in a productive way is a very small way to get back to focusing on you and bringing your inner longings and aspirations into the light. Once you have some images on those boards, find a quiet time. Pour yourself a cup of tea and browse through them. See if you can find patterns and repeats. See if certain words show up over and over again. Edit out what doesn’t feel right anymore. This is your path to self discovery. It is a first step in the creative process that I use with clients to help them figure out how they want to feel in spaces or with their wardrobes. We’ll talk more about the next steps in the creative process in another episode, but for now, just sink into those feelings you’re capturing. Let them wash over you and see how they sit. Notice when you kaboshed the possibilities, tell your bossy brain to stand down. For now, we’re not at the decision making stage. We’re only imagining and that safe and private, there’s no need for vigilance. There’s no need to be done. There’s no need to make choices. Just relax into the feeling of possibility and allow the ideas to come into focus. Remember that this work is important and it’s unique to you. It’s the path to creating a life you love. Feel free to reach out to me via DM or Instagram or via the website, www.anniekipstyle.com. If I can be of help to you on your journey, it would be my honor. Until next week, keep making your life look the way you want to feel.